Saul Vera was born in Caracas, Venezuela. Among many notable achievements, Saul is a world class composer, arranger, teacher as well as a master Bandola and Mandolin player. He is a musical director & arranger with great knowledge and experience in both traditional and Venezuelan folk music. Since 1986, he leads his own successful musical project called: “The Saul Vera Ensemble”. One interesting fact is that Saul has had the rare opportunity to study and play music from both an academic and a traditional approach. Today, Saul is a sought-after performer who has participated as a soloist and has also been an invited artist to numerous national and international events and concerts. He has shared the stage with other great musicians such as, Chico Buarque, DJavan, Zimbo Trío, Paco de Lucía, Ray Barreto, Gilberto Gil and Michel Petrucciani. In 1994, Saul was awarded the “Premio Proyecto Eco” by Mozarteum Foundation and the “Casa Miranda” award in London to further his musical research and develop new works in England. Saul is also the author of the landmark book “Techniques for learning Bandola Llanera” Ed. Fundarte, 1993. In 1997 and 1998 Saul and his ensemble toured Europe playing important venues in Bonn (Germany), Rome, Paris, Geneva, Bern, Motreaux (Switzerland), and Brussels (Belgium). The tours were a great success and resulted in excellent newspaper reviews with great accolades from the critics. 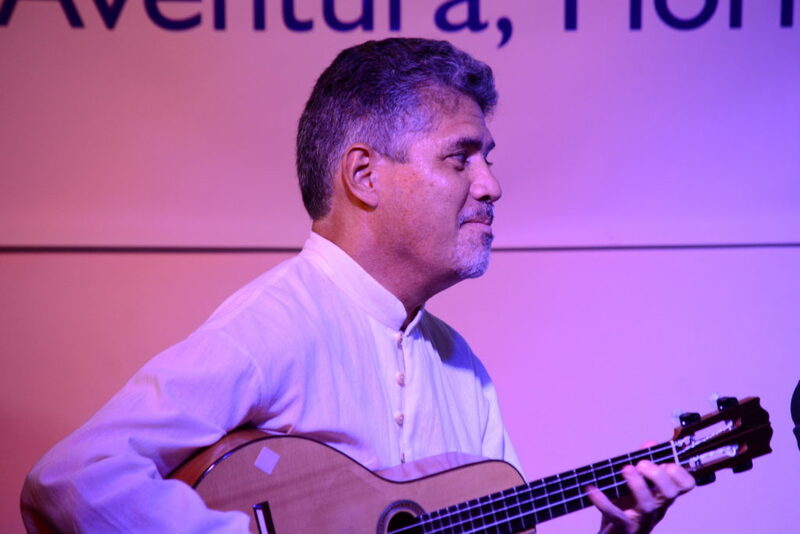 In 1999 Saul Vera recorded a very popular Compact Disc “TOCANDO TIERRA” which included performances with Bela Fleck, Alex Acuña and Abraham Laboriel. This CD was in such demand it was distributed throughout the Americas. In November of 2000, Saul again toured in Germany, playing the World-wide Expo-Hanover 2000, again to great press reviews. In August of 2000, Vera released in Caracas his “Concert for Bandola Llanera with Orchestra”. Saul performed with the “Gran Mariscal de Ayacucho” Symphony orchestra, and again in 2001 with the “Venezuela Symphony Orchestra”. In the summer 2002 Saúl Vera was invited by The Nature Conservancy organization to perform concerts in United States in Washington D.C., Cleveland and New York. In 2004 within his international program he made concerts at the “Bolivar Hall” in London and at the “New Morning” in Paris, one of most important jazz venues of the French capital, in which Saul Vera shared the stage with the consecrated Martinican piano player Mario Canonge, among others. In 2006 Saúl Vera celebrated the 20th Anniversary of his musical project “Saul Vera Ensemble” and was received in the most important Concert Hall in Venezuela, the “Aula Magna” at the “Universidad Central de Venezuela” by the “Orquesta Sinfónica Municipal” from Caracas under the direction of Rodolfo Saglimbeni. That same year, Vera embarked on a four-city musical tour in Austria, sharing the stage with Venezuelan singer Eugenia Mendez, on a tour that culminated at Joe Zawinul’s Birdland Hall in Vienna. In 2007, Saul performed twice his concert for Bandola Llanera accompanied by the Symphonic Orchestra and the National Philharmonic Orchestra. A few years later, in 2009, he performed his concert for Bandola Llanera and Symphonic Orchestra with the “Simón Bolívar Orchestra” from the “National System of Youth and Children’s Orchestras of Venezuela” under the conduction of Christian Vazquez. Saul Vera has been Teacher at Traditional and Folk Music Appreciation Workshops at Francisco de Miranda University, Coro, Falcon Estate, Venezuela. From 1989-1992 Educational Coordinator FUNDARTE Music Workshops. Mayor of Caracas Social and cultural program. Visiting Fellow, at the “Venezuelan Institute for Culture and Cooperation” Port Spain, Trinidad in July 1989. Lecturer for the Musical Appreciation workshops Cycle at elementary Schools of Miranda State, Venezuela. Lecturer and Visiting Professor at the Instituto Universitario de Estudios Teatrales (Theater Studies University Institute, now merge to National Experimental University of arts), Chair of artistic production. 1994, Visiting Professor of Architecture Postgraduate School, History and Criticism of Architecture Department at Architecture and urbanism Faculty at Universidad Central de Venezuela (Venezuelan Central University) “History of Architecture, Cultural Heritage and Research Projects”. Saúl Vera has been Visiting Professor at the Universidad Metropolitana de Caracas, (Metropolitan University of Caracas-Private University-) Graduate Program, as a teacher for Advanced Studies on Venezuelan identity Diploma. From 2005 to 2009, Professor of “Venezuelan Folk Music Level I and II” and Venezuelan Music History at the Institute of Musical Studies (IUDEM now called National Experimental University of Arts). From 2005 to 2009, Professor of Chairs Bandola Llanera, Mandolin, Venezuelan music for Ensembles and at the Music Conservatory Simón Bolivar, National System of Youth and Children’s Orchestras of Venezuela ( “El Sistema”). Caracas. 1981 Japanese Prime Minister Office. Contest credentials. Invitation to Meeting for Latin American Youngest in Japan. 1994 “Proyecto Eco” by Mozarteum Foundation and “Casa Miranda” award and grant to develop a musicological researching work during four months in London. 2006 Municipal Music Prize for short films. “Saúl Vera Ensemble” Navy Honorable Mention artistic merit. “Techniques for learning Bandola Llanera” Ed. Fundarte, Caracas. 1993. “Contemporary vision of Venezuelan popular music”. at “Venezuela es así” (Venezuela is that way). Ateneo de Caracas & Casa de América. Caracas-Madrid. 1993. “The Mandolin in Venezuela: a brief history” at www.saulvera.arts.ve Caracas. 1997. “The Bandola Plucking of centuries”. at “Imagen” Magazine, 37th year. Special Issue, CONSEJO NACIONAL DELA CULTURA, Caracas, 2004. Si de trabajo tesonero y reivindicador tuviésemos que hablar en esta ahora bolivariana patria, el músico y compositor Saúl Vera tendría que estar entre los primeros de una lista de los nacionales que más han contribuido a promocionar nuestra más genuina venezolanidad. El maestro Saúl Vera ha recorrido, de cabo a rabo, la dispar geografía venezolana para incorporar a sus musicales cursos, porque buen didáctico docente es, las expresiones de una Venezuela conocida y las más de las veces inédita que reside en los disímiles instrumentos y en las plurales expresiones de nuestra, en ocasiones, denostada música popular, no la populista que nos asimila sin galanura al joropo mal bailado, y al arpa, cuatro y maracas de campechana ejecución. Habita el músico concertista y compositor en el cuerpo de la bandola, ese instrumento casi extinto y desconocido que hace de todo a la vez, para ser único en su pluralidad, aunque requiera de otros aparejos musicales para lograr su máxima factura. Saúl Vera, maestro, bien lo sabe, y sin exclusiones, se ensambla con otros semejantes melódicos a fin de que otros virtuosos acompañen su música solitaria sin vocación de soledades. El maestro músico – docente – concertista – es también comunicador social por excelencia; en la radio venezolana semanal y religiosamente dirigía, dominical, un programa señero, concebido para la magnánima promoción de sus colegas. Nombres y discos, ejecutantes y compositores, artistas en estreno y reconocidos, son tratados por igual por un cofrade que no conoce la diferencia ni el egoísmo. Los que nos preciamos de su aprecio, los que disfrutamos de su genuino afecto, sabemos que en su fantasía de gentil hombre y en la interpretación de su inseparable bandola solidaria reside un venezolano de excepción que la Patria sin protocolos reconoce y recompensa, más allá de preseas y galardones de un solo color o de un mismo signo. This function has been disabled for SAUL VERA OFFICIAL.